Spitsbergen or the archipelago of Svalbard has a long and interesting history of many chapters, which partly overlap in time, partly follow upon each other with a rather quiet phase in between, but are often not related of each other. So it is, to some degree, possible to look at each one separately, rather bearing the European history and economic development in mind, which is decisive for any economic and scientific activity in the arctic. Legend has, that already the vikings found »Svalbard«, but for this there is no hard evidence. It is likely that Pomors, hunters and fisher from the White Sea coast of Russia, knew Spitsbergen as a good hunting ground already before it was ‘officially’ discoveerd by the Dutchman Willem Barentsz in 1596. Soon after Barentsz’ famous journey, the first phase of whaling started in Spitsbergen’s nearshore waters. In the 19th century, explorers and scientists discovered Spitsbergen as an interesting playground. After the Pomors had disappeared from Spitsbergen, Norwegian trappers started to hunt polar bears, foxes and other arctic wildlife in the late 19th century. This time saw also the advent of adventurers/explorers who tried to reach the pole, starting from Spitsbergen, and increased attempts to make some money with mining. Until the First World War, Spitsbergen was still no man’s land, but in 1920, a treaty was signed in Paris which put Spitsbergen under Norwegian administration and sovereignty, but guaranteed free access for citizens of all signatary nations as well as demilitarisation. The Spitsbergen Treaty came into force in 1925 and remains valid. Name confusion: Svalbard is the name for the archipelago, and Spitsbergen the main island. The name Svalbard appeared for the first time in 1194, although it remains uncertain what exactly it referred to. Since Barentsz’ discovery in 1596, the name Spitsbergen commonly was used (German spelling: Spitzbergen). In England, Spitsbergen was often called Greenland in the 17th and 18th centuries, due to the supposition that Spitsbergen and the real Greenland were linked somewhere in the north. The true reason may actually also have been that the Dutch name Spitsbergen was not accepted. The term Svalbard has been re-introduced by Norway when the Spitsbergen Treaty was in force. There are good practical reasons for having two different names for the largest island (Spitsbergen) and the whole archipelago (Svalbard), but it may be fair to say that the historical base for the use of the name Svalbard is rather weak. The 1920s also brought new attempts to reach the pole. Roald Amundsen and Umberto Nobile made their now legendary attempts from Ny Ålesund, with the well-known, dramatic results. Russians and Norwegians have always been living near each other in Spitsbergen, both before and after the war, with good cooperation and various contacts taking places nowadays. 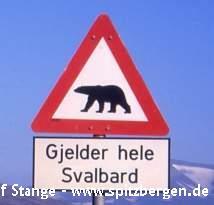 »Watch out for polar bears – applies everywhere on Svalbard«. Polar bears are potentially dangerous, but many people look at them mainly as a tourist attraction.